Many dairies have improved unit sanitation by fabricating a portable wash sink for use in the parlor after milking. The construction is easy; a stainless steel wash sink should have casters installed on all four legs. At the end of milking, the tub should be half filled with warm water and an appropriate amount of manual chlorinated cleaner. The tub can be pushed down the parlor to facilitate cleaning the units before they are mounted in the jetter cups for wash up. Two or more units should be placed in the tub to allow some soaking time for one unit while a brush is used to clean the first unit. Using a wash cart is much easier and quicker than trying to hand wash units or using a pressure hose to clean units after milking. 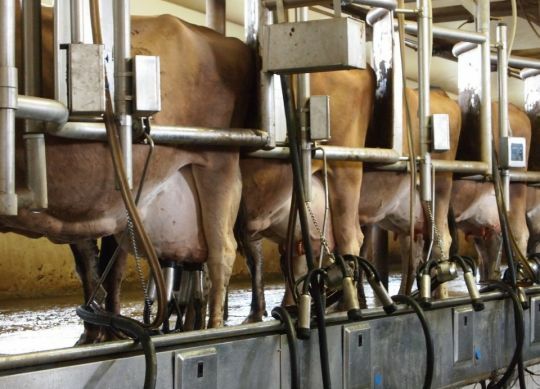 Units that are washed on a regular basis will not allow manure and dirt to stick as easily and therefore reduce the number of plugged bleed holes, which improves the overall milkability and consistency of milking. Some dairies have modified these wash carts by installing an unbreakable Plexiglas cover with a piano hinge. During milking, supplies can be kept in the sink. After milking the supplies are removed and the top is opened so the sink can be used to more easily clean units. Another good way to maintain a parlor that sends a message of “thinking clean” is to use an equipment foaming system. These can either be portable or permanently mounted in the parlor or breezeway. Specialized products are available from equipment and chemical supply companies specifically designed to clean or acid rinse parlors using a foamer. Foaming parlors will maintain the stainless steel of cabinets, milk lines and other equipment in like-new condition. When parlors and milking facilities are kept clean, it improves the milk harvest technician’s attitudes and sends a strong message that the dairy’s management cares about adequate parlor cleanliness and sanitation.